Whether you have allergies or are just looking for a delicious mix to make exceptional vegan pancakes and waffles, Cherrybrook Kitchen has you covered with this quick and easy mix. Each 18 oz. 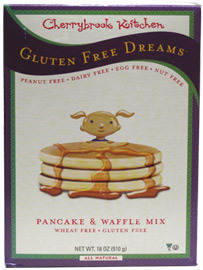 (510g) package of mix makes approximately twenty-one 4” pancakes or 9 waffles. This mix is wheat and gluten-free, and is also free of other common allergens including peanuts, tree nuts, dairy and is Kosher. $6.99 per package. From Anonymous of Salisbury, North Carolina on 12/4/2016 . Best pancake/waffle mix ever! I will definitely be buying this mix again as soon as it's back in stock. No horrible after taste like some vegan mixes I've tried. From Lakecia McGraw of Huber Heights, Ohio on 3/10/2016 . These are the BEST vegan pancakes that I have ever had. They are so fluffy and they become golden just like regular pancakes. From Stacy M of St Charles, Missouri on 2/19/2015 . I thought these were quite good. I would recommend. From D L Halse of Port Orford , Oregon on 11/9/2011 . This pancake mix does cook up really nice but the taste is far to sweet for me .Leaves a funny taste in my mouth, not sure if it is the baking soda perhaps?I give it 3 stars because this mix does make a nicely cooked pancake,just beware that this is a very sweet mix. From Kathy Nese of Latrobe, Pennsylvania on 8/29/2011 . Finally a GF pancake that isn't grainy or flat with no flavor. This mix is the best we have had and we have tried most available along with using recipes found online and in allergy magazines. The mix is also great for waffles.